Durable and convenient a lock box is a treasure to own. But its main use is to keep others out and allow you easy access through a quick spin of the combination. When a situation arises in which you have to change the lock box code, it's not always easy to remember those instructions you placed somewhere when you first opened the package. If you have inherited or bought a used lock box, then you may need to completely reset the combination in order to access the interior. A lock box combination is sturdy and reliable, popping open when the correct code appears within its mechanism. Behind the simple or ornate casing that holds the combination is a wheel pack. They work together to get the combination. Most combination locks have a dial attached to a spindle. The spindle runs through the wheels and a drive cam. The more numbers there are in a combination, the more wheels the lock will have. When the dial is turned, the spindle turns the drive cam, which places the drive pin in the small tab – or wheel fly – that is located adjacent to the wheel. A wheel fly is attached to each side of a wheel. When the correct combination is spun on the dial, all the wheels and their notches align with a solid click. The fence blocks the bolt that secures the door and keeps them safe from opening before all the wheels are aligned. A lock box comes with a preset factory combination. That number that is set by the factory is usually 000. Some companies may use a letter or number that is repeated, such as AAA or 333. Once the lock is open, push the change lever toward the center and opening. The combination wheel needs to stay set at its factory combination to complete this task. Once this is done, put in your combination. If you don't know the code, call the manufacturer. They may be able to walk you through the specific combination wheelset you have. 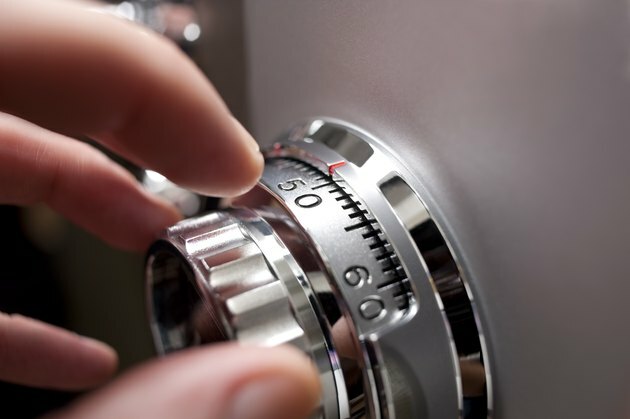 Whether you are checking out the Kidde lock box instructions or those for the MMF Industries key cabinet instructions, most combination locks can be reset. A key lock can be rekeyed. A lock box should have a combination that is easy to remember for you, but not easy to decipher by those you may not want to gain entrance to the contents of what you hold inside. Make sure to test the new code at least twice before closing the box or you may have to contact the manufacturer of the lock box to gain entry.